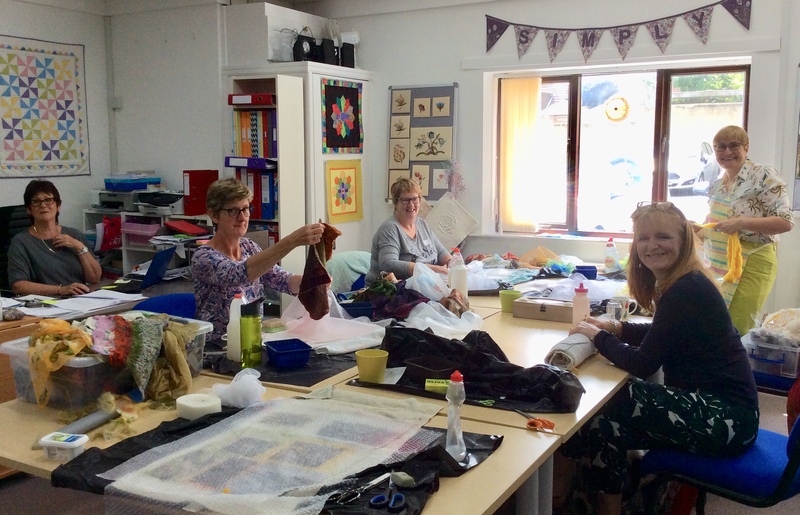 Yesterday I was teaching in Risley, just outside of Derby, working with a creative group of ladies called “Material Girls”. 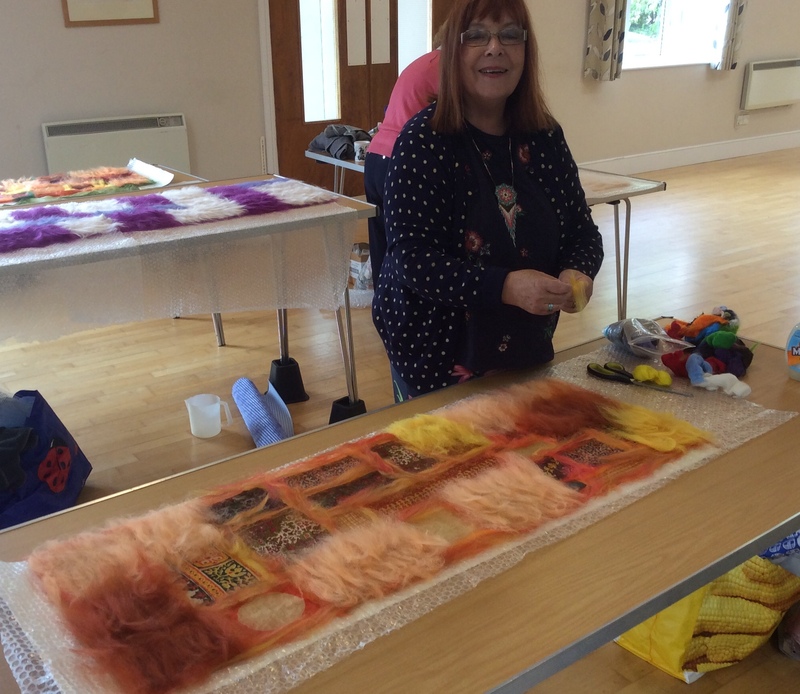 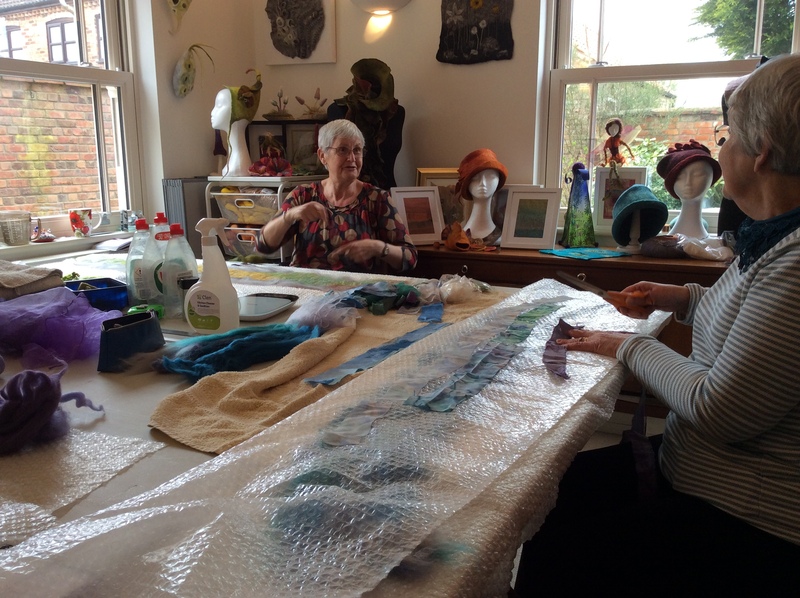 They had invited me over to spend the day with them experimenting with Nuno Felting. 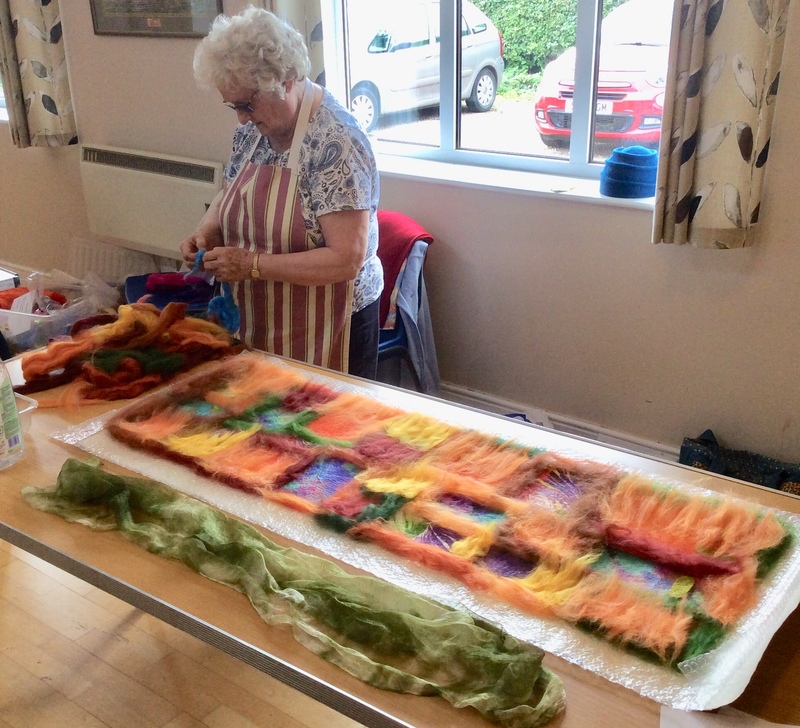 The ladies all brought a selection of lightweight fabrics ranging from pure silk, viscose and muslin through to polyester and netting as well as Merino fibres. 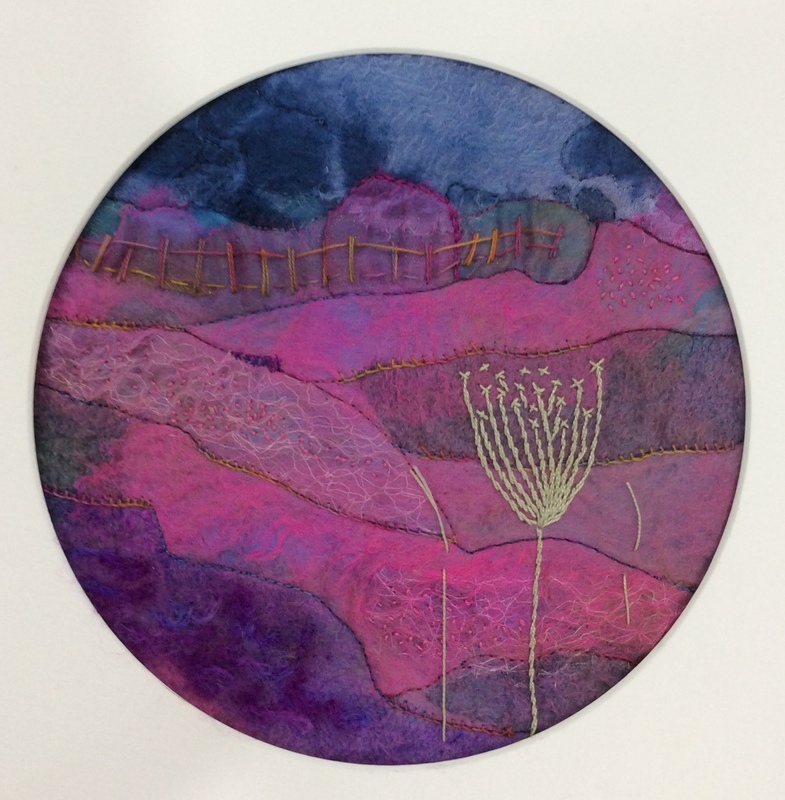 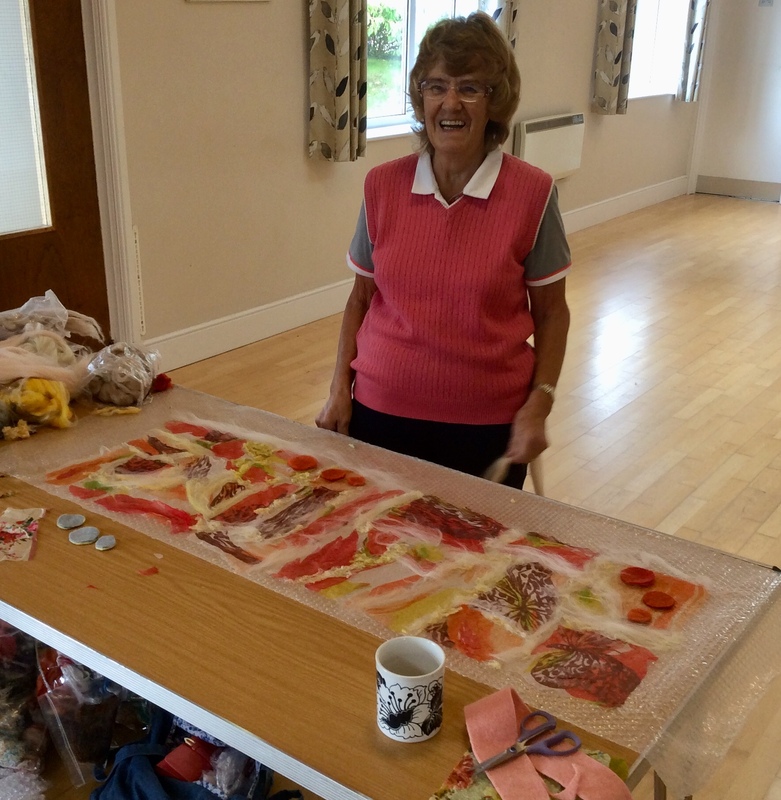 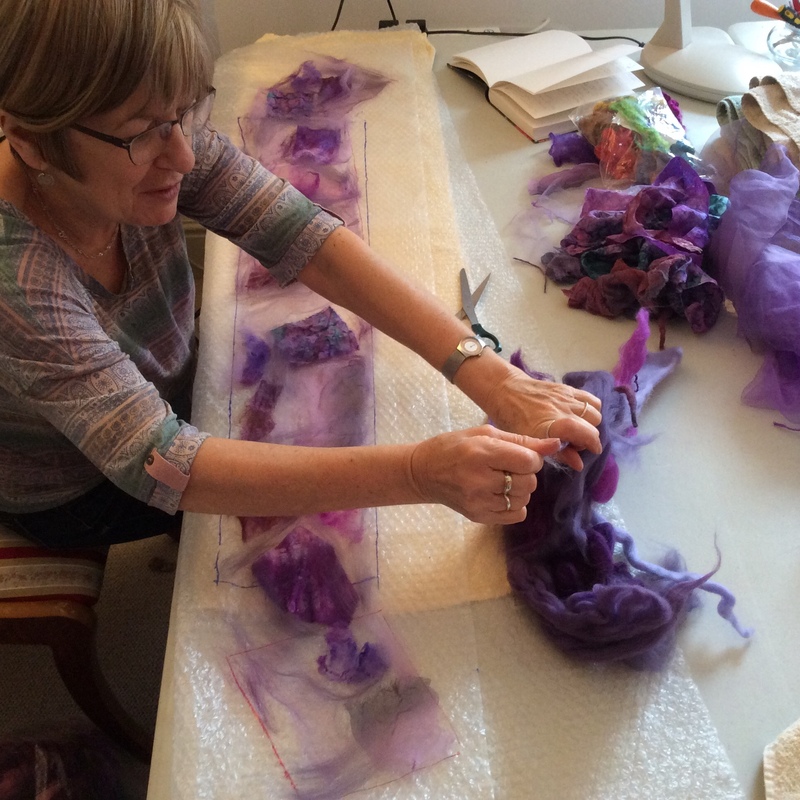 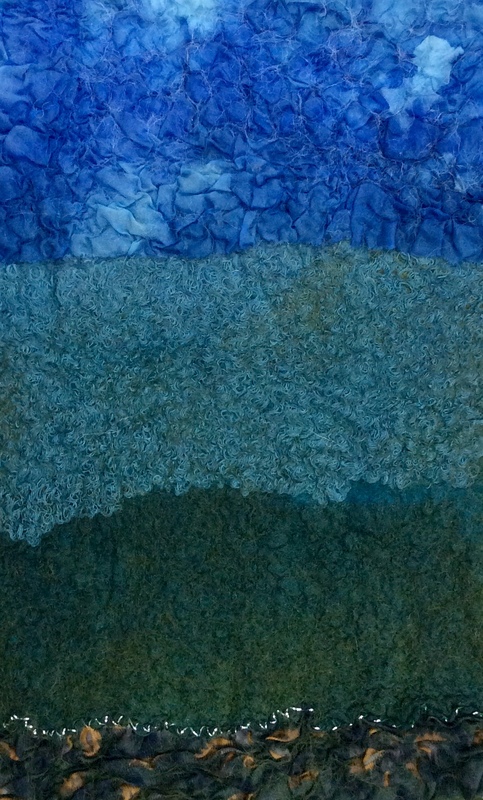 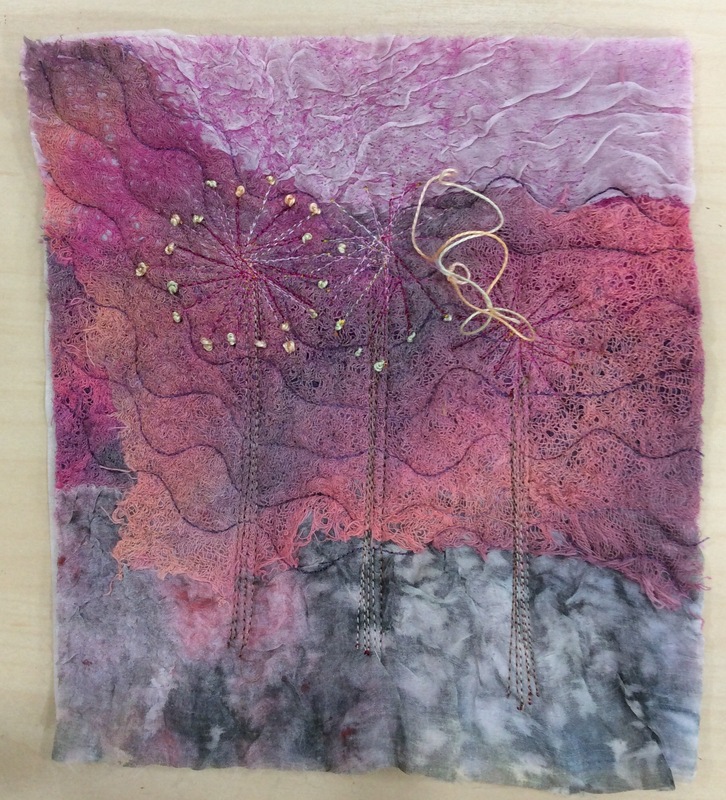 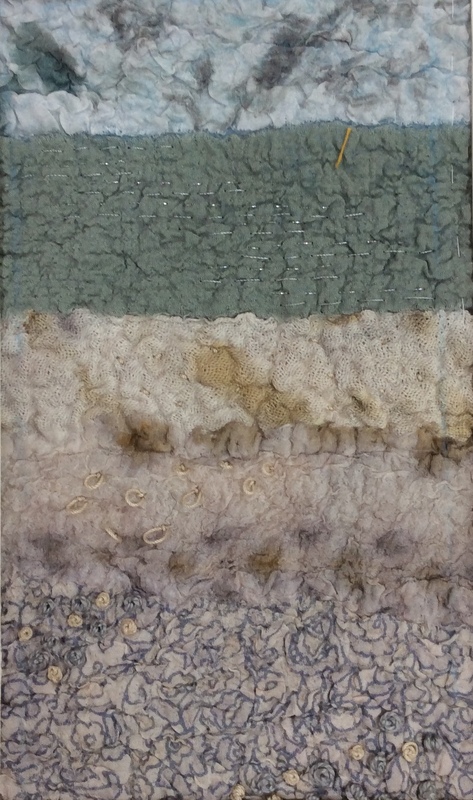 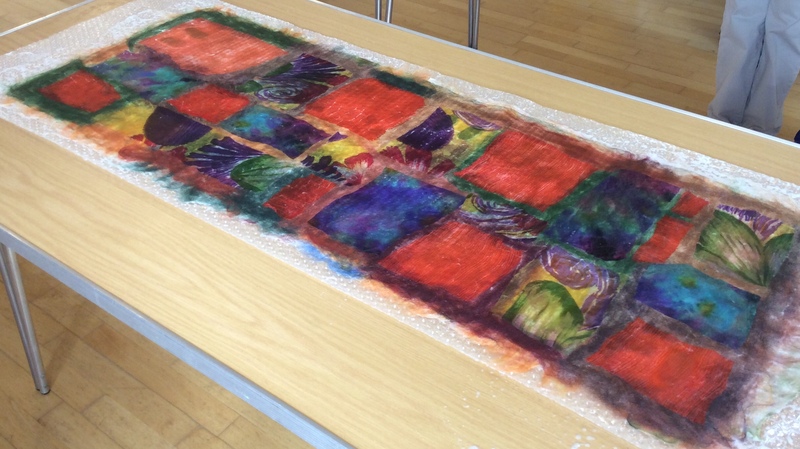 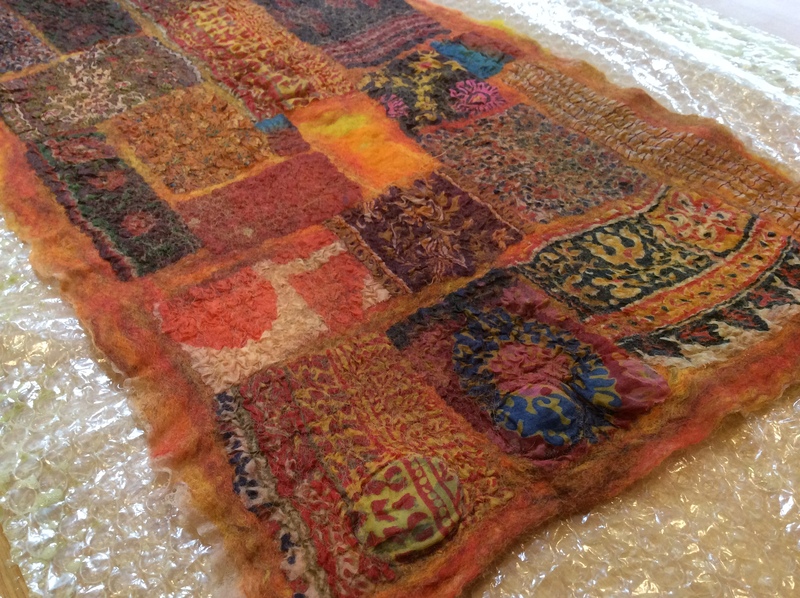 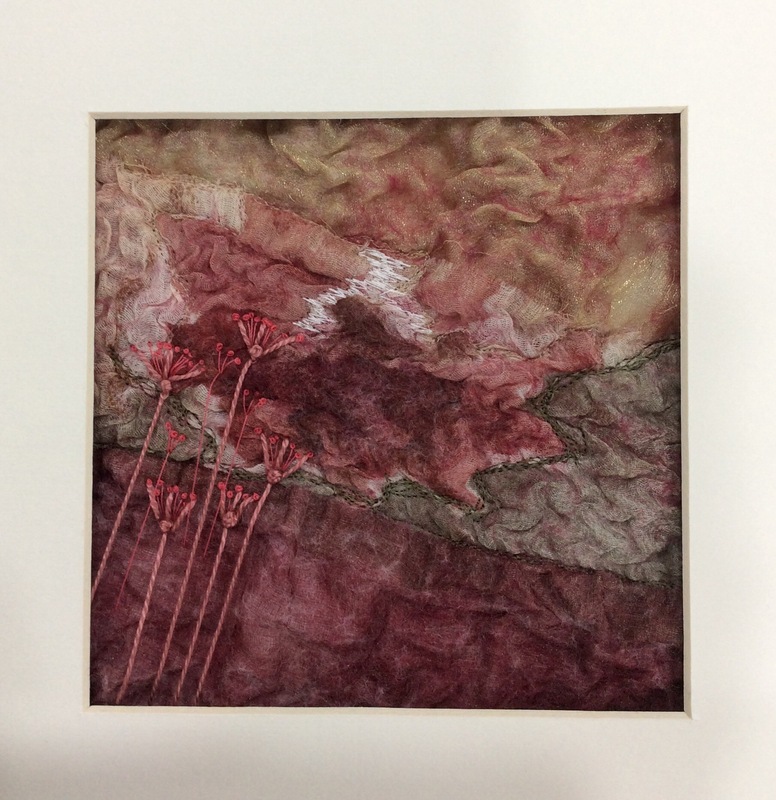 The idea was for this to be an experimental session making samples which could later be stitched and framed, making a unique piece of textile art. 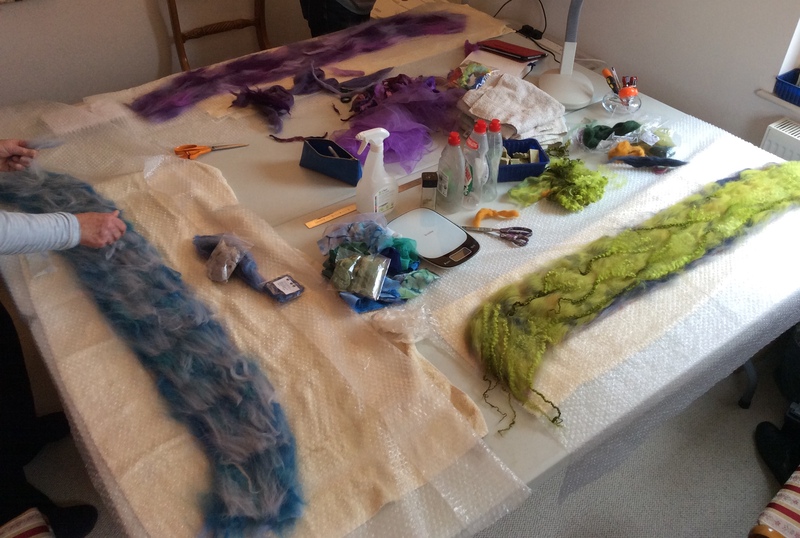 The results were absolutely stunning! 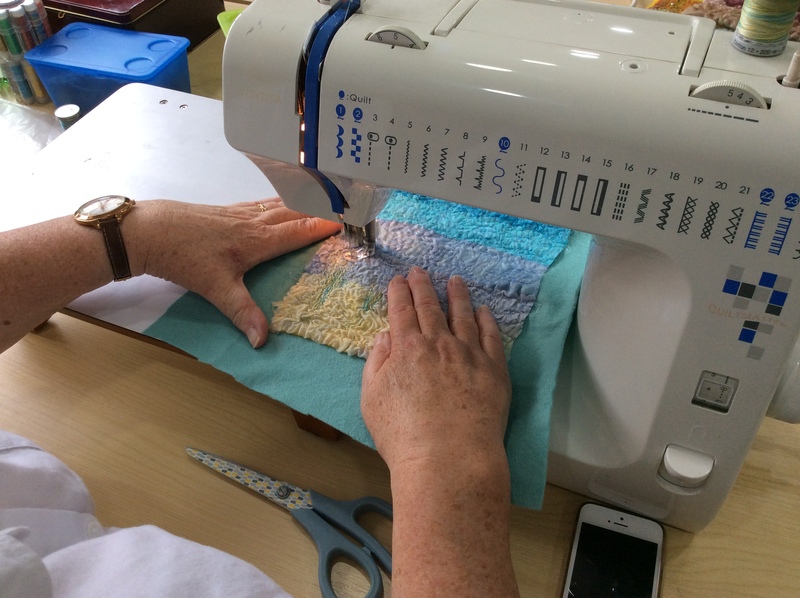 Depending on the choice of fabrics this process can be very time and labour intensive and therefore I was a little concerned as to the staying power of my group! 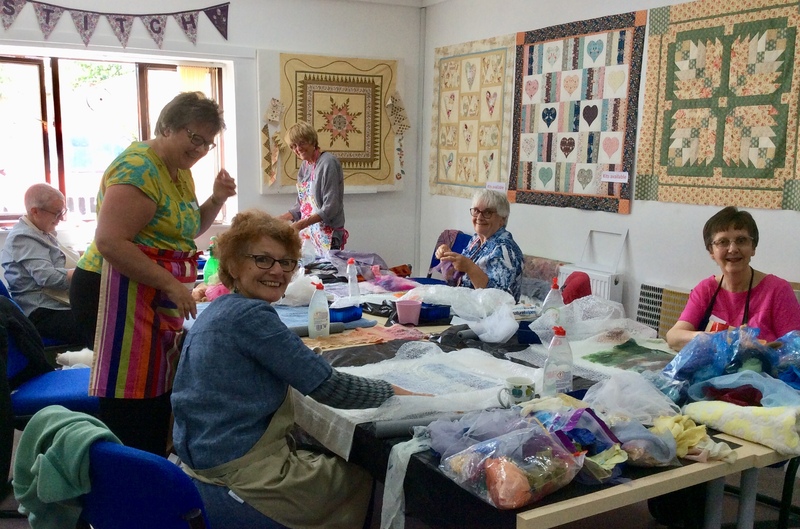 I needn’t have worried….there was a lot of coffee, biscuits, laughter and determination to keep us going and the results really paid off. 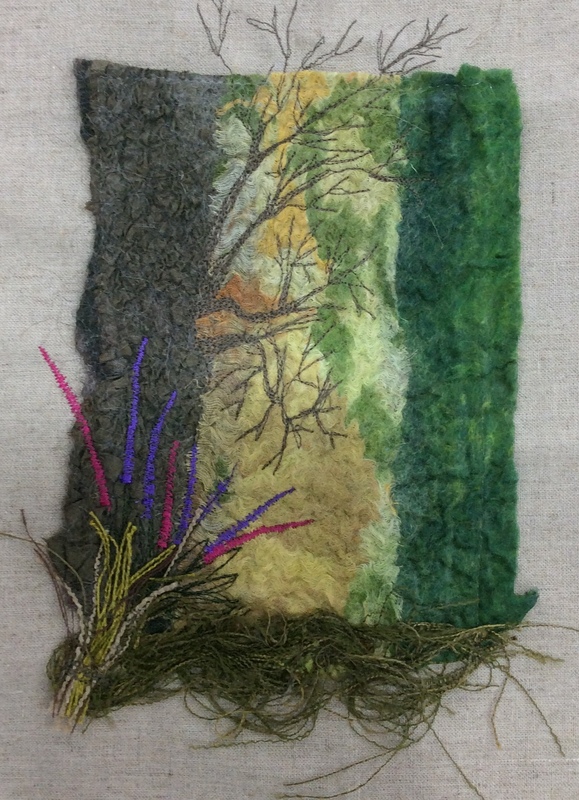 Once their work was finished the ladies used picture mounts to select certain area which appealed to them for stitching. 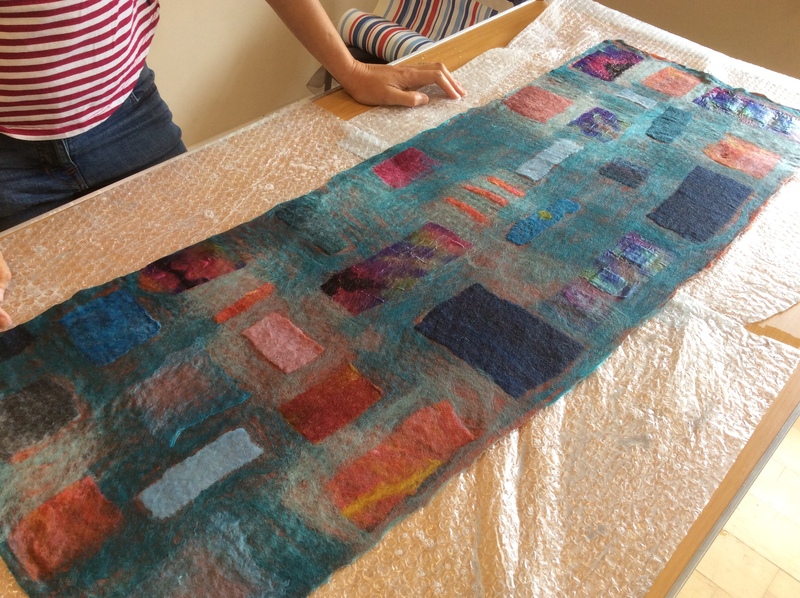 Non of this fabric will get wasted as even small off cuts can be used for making brooches or used in card making, mixed media work, etc…..
Once again, it was a pleasure to work with a group of like minded ladies and be able to share my enthusiasm and passion for Feltmaking and Textiles. 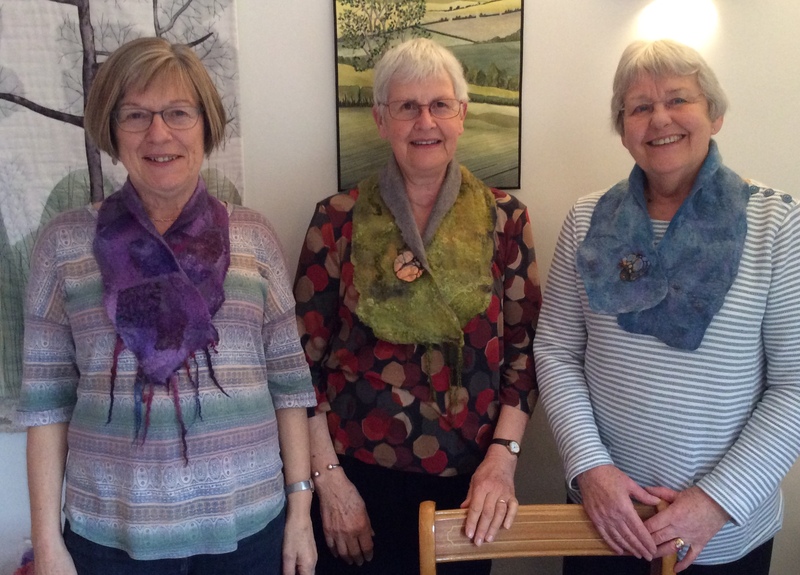 Many thanks to Viv and Jenny for arranging my visit and helping to make the day a success. 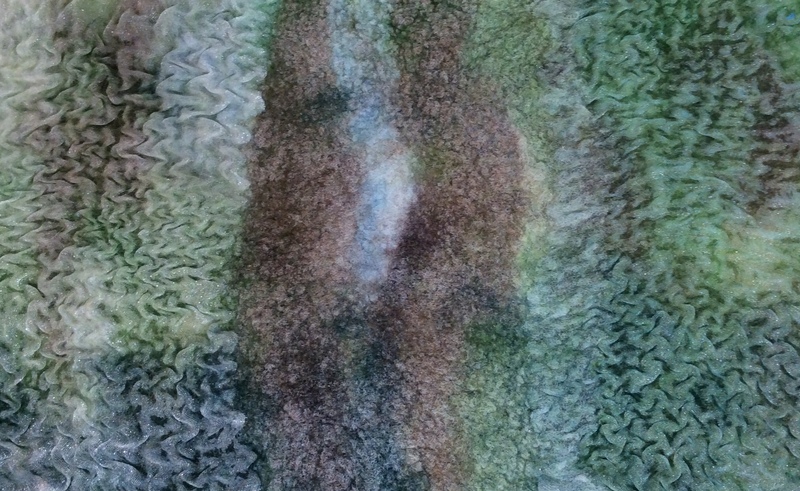 I look forward to seeing you all again sometime. 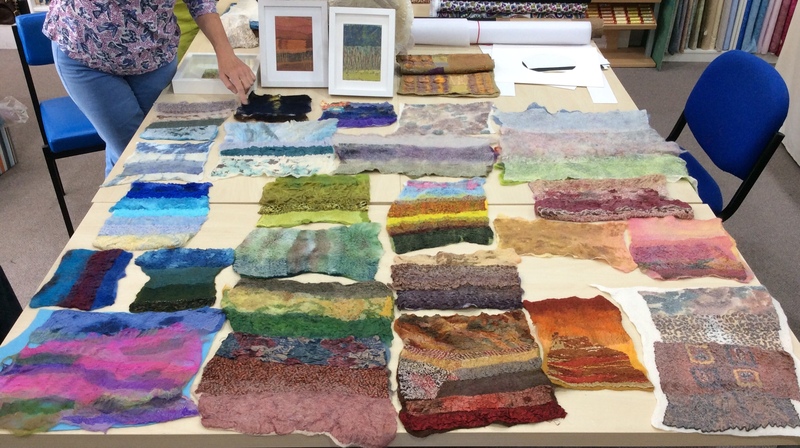 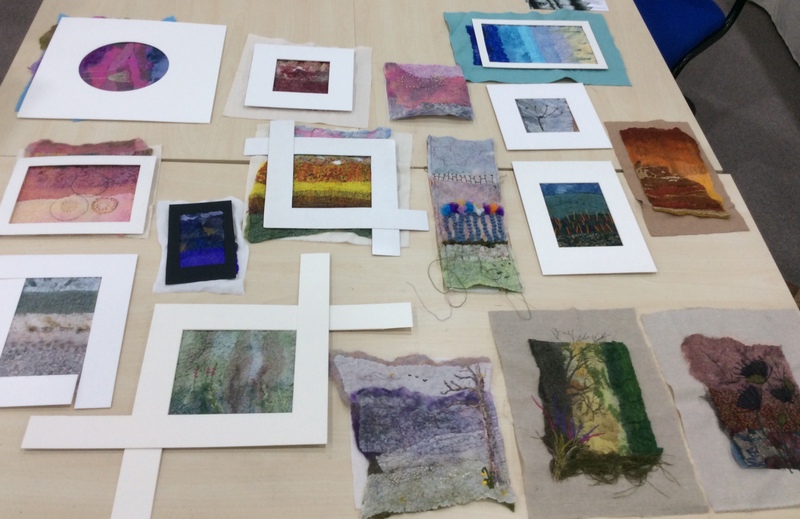 A quick update on the pictures made at this workshop and a big thanks to Anne who has sent me photos of the two pictures she made from her Nuno samples. 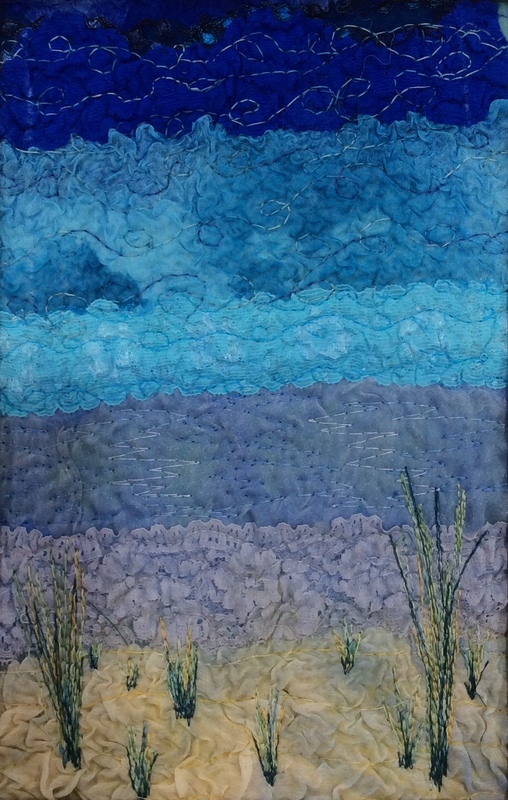 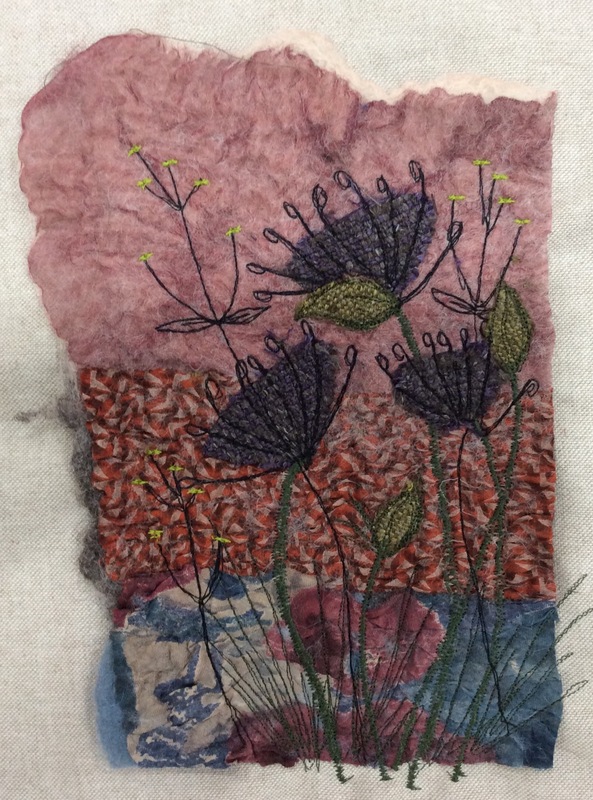 Just a little stitching is all it took to transform the fabrics into beautiful landscapes…..
At the weekend I was a having a clear out and came across some little Nuno samples I made a couple of years ago at Artvango. 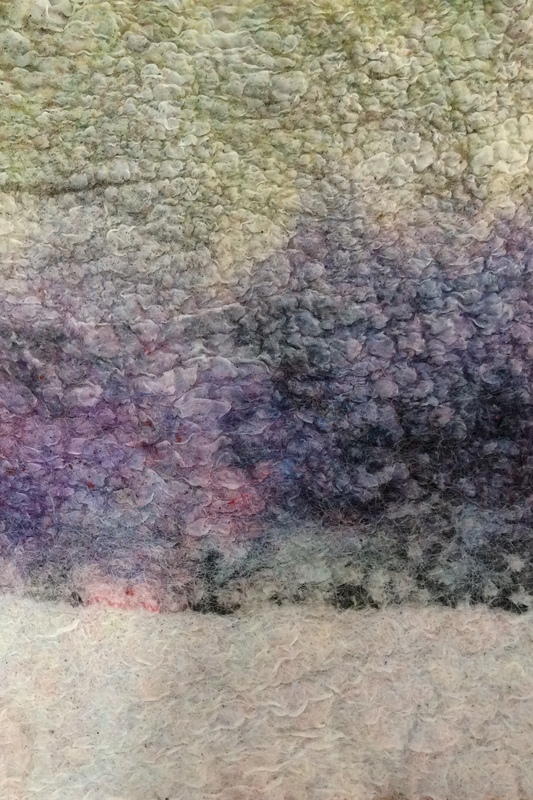 I decided they were too good to put back in the drawer so I’m making some small pieces of art with them, this is the first Nuno Landscape. 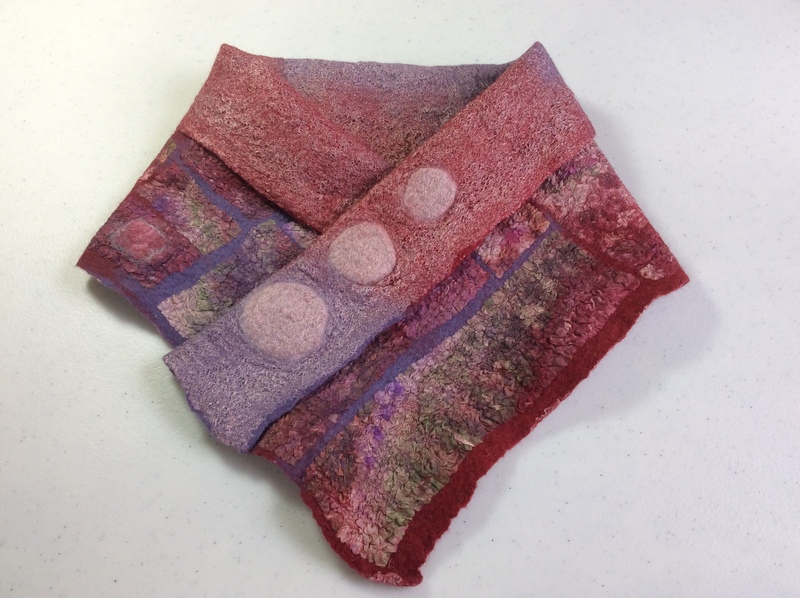 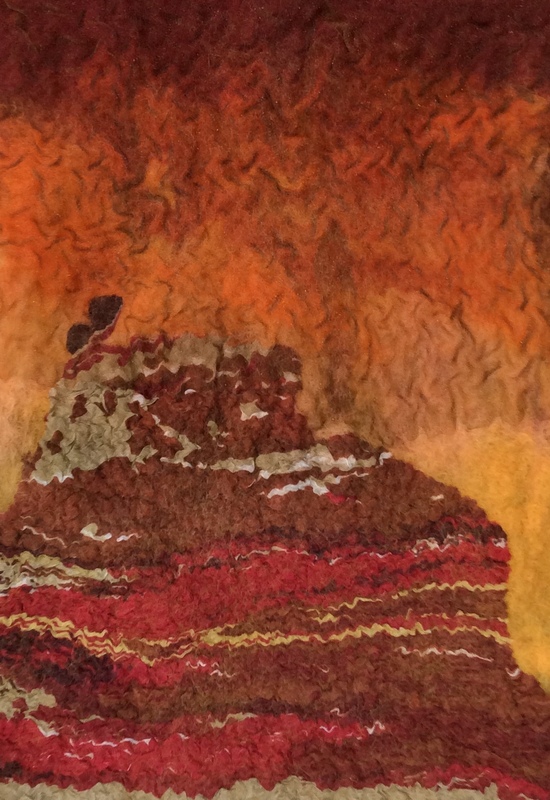 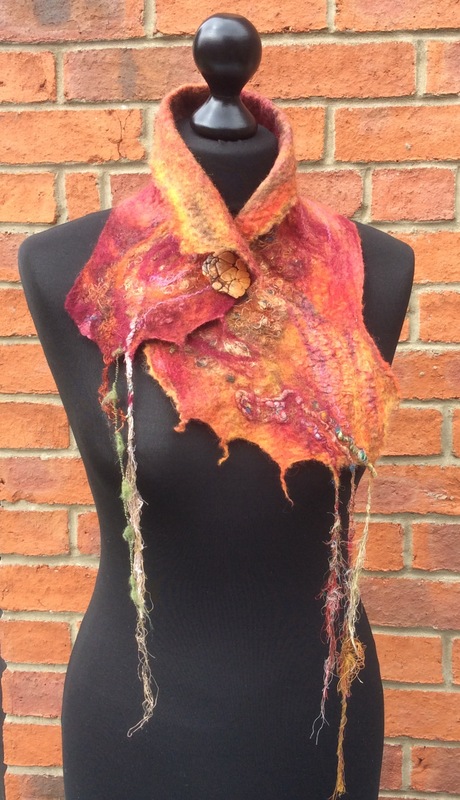 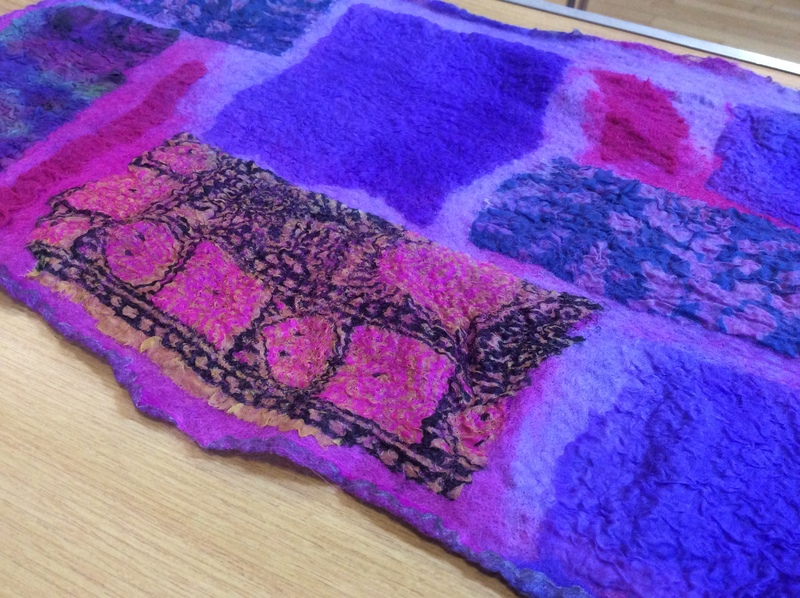 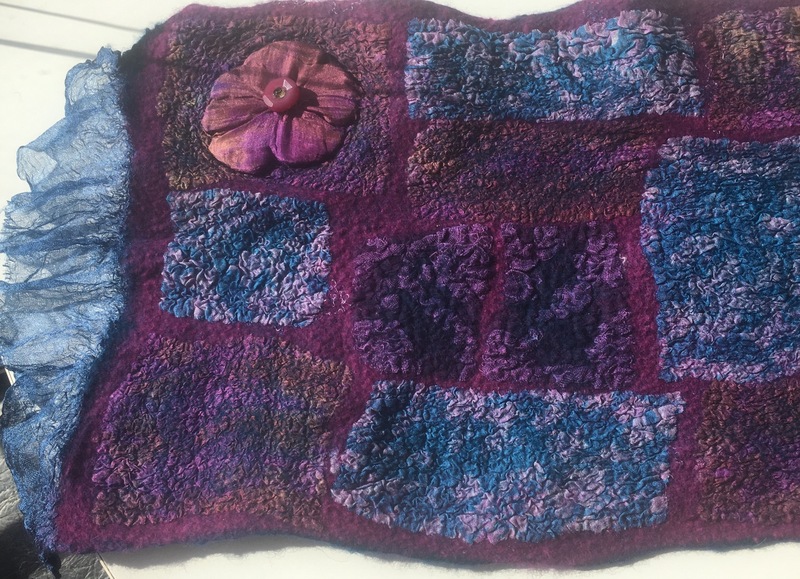 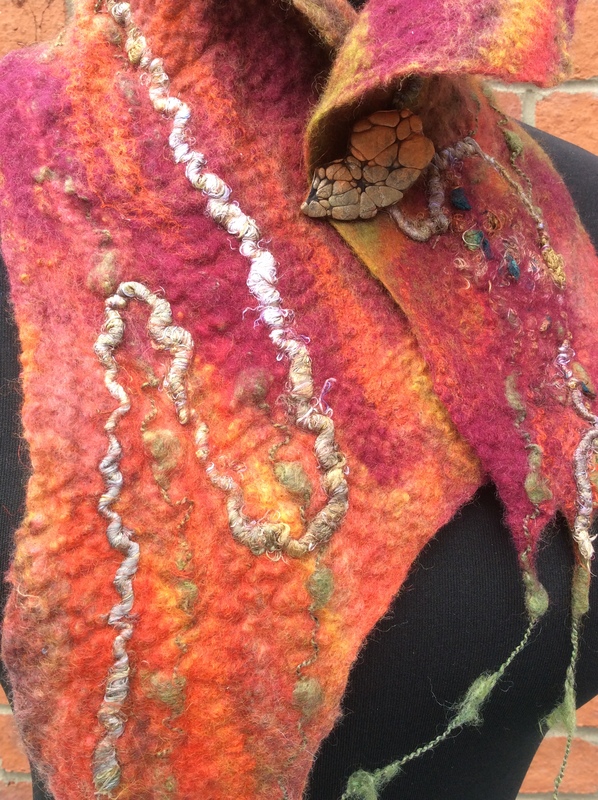 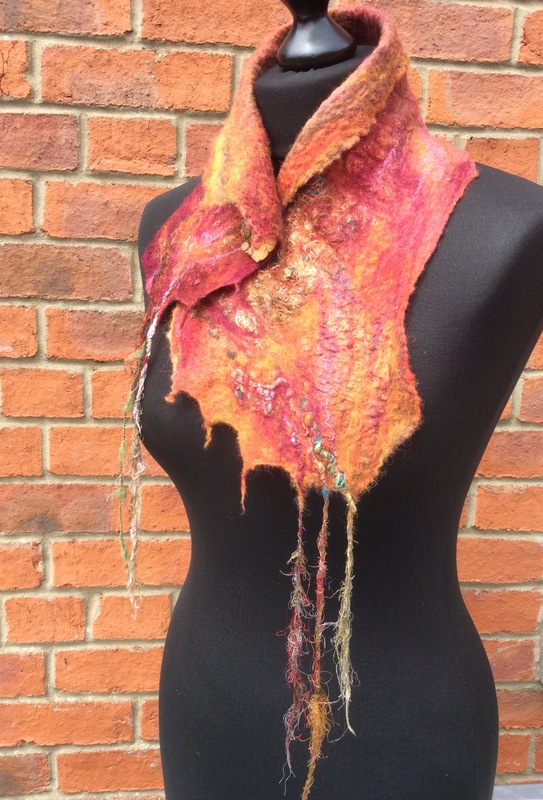 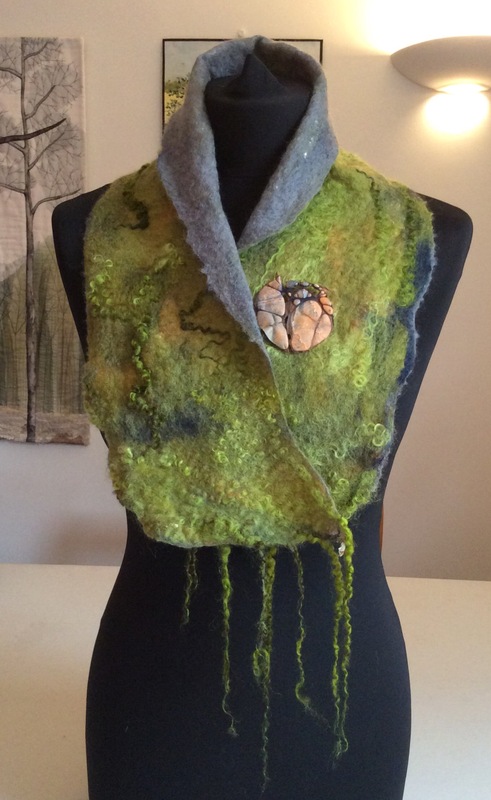 It was felted with Merino, two of the fabrics are Viscose and the third (central section) was cut from an old wool scarf. 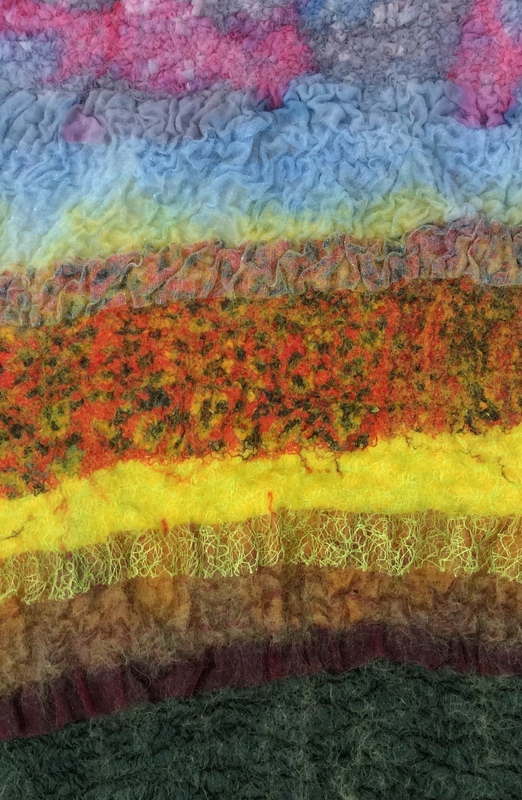 The stitching has been done using Perle and a variegated thread I dyed while I was up in Ullapool. 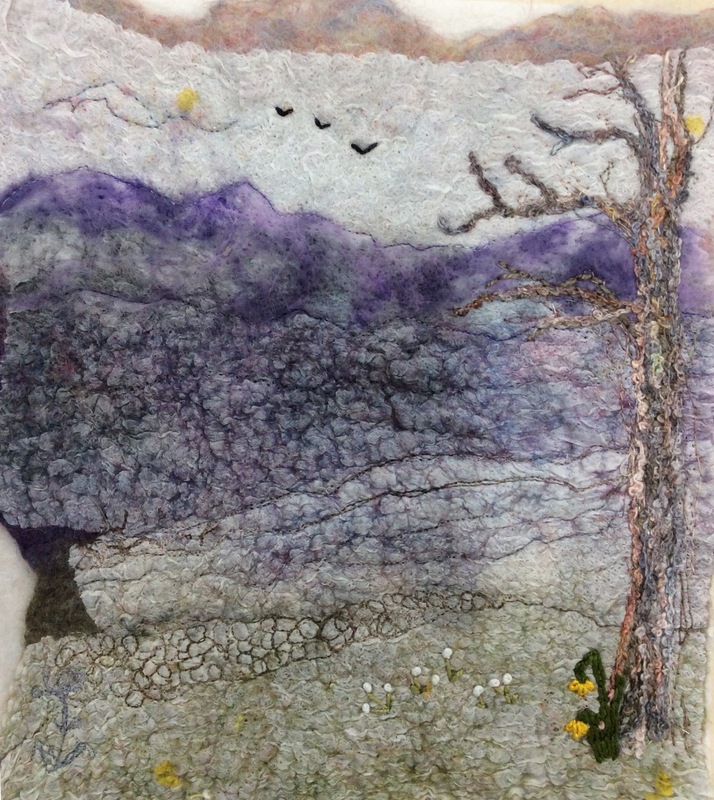 I just need to find a suitable frame now. 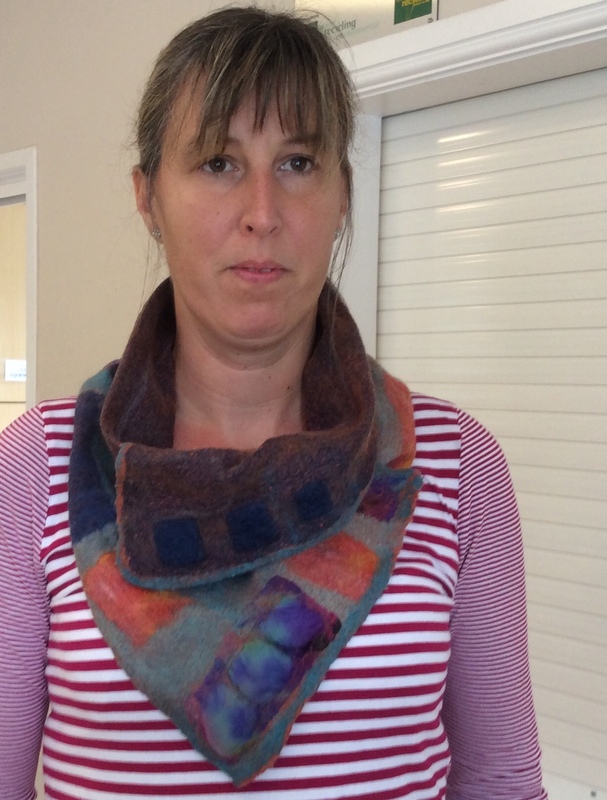 I was pleased with the shape and size of the grey merino collar I made recently so thought I would stick with those proportions to make an Autumnal Nuno Collar using the “tile” technique. 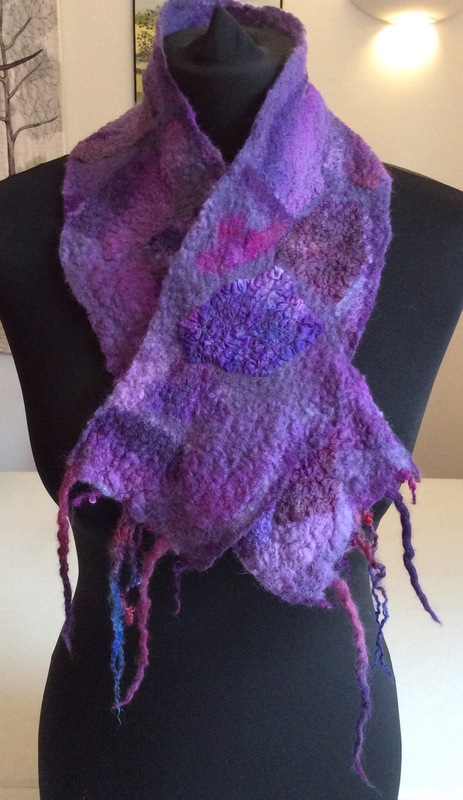 Colour scheme based on a Charity shop silk scarf. 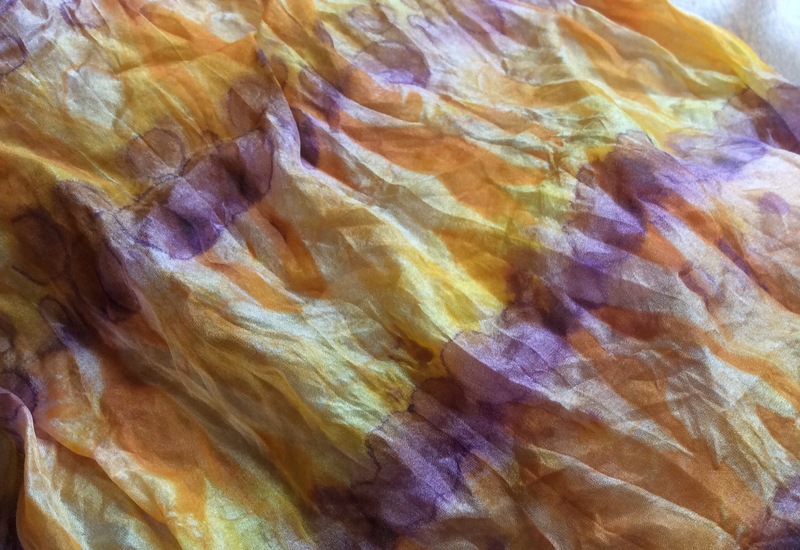 A shop bought yellow/orange/purple silk scarf formed the basis of my colour scheme. 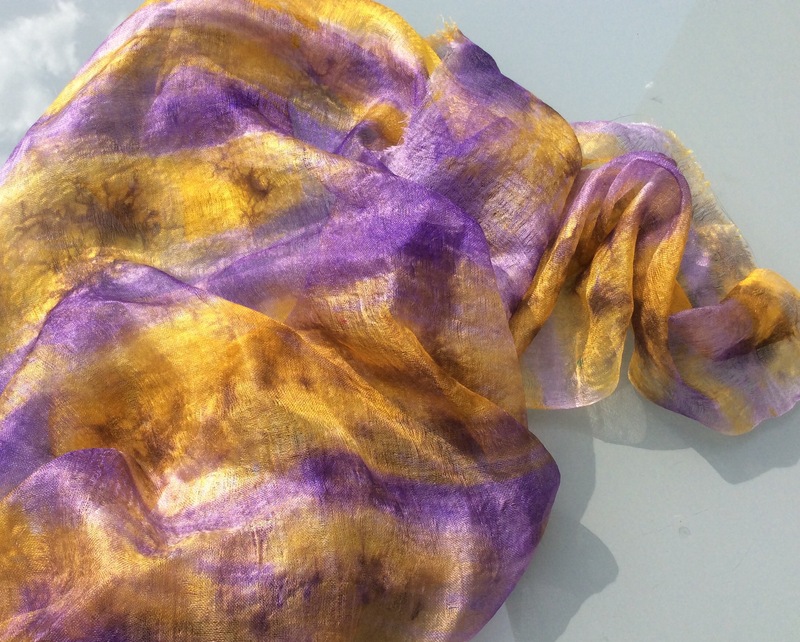 Using a set of Colorhue silk dyes I mixed a yellow and purple to use on Uzbek silk to tone in with the patterned scarf. 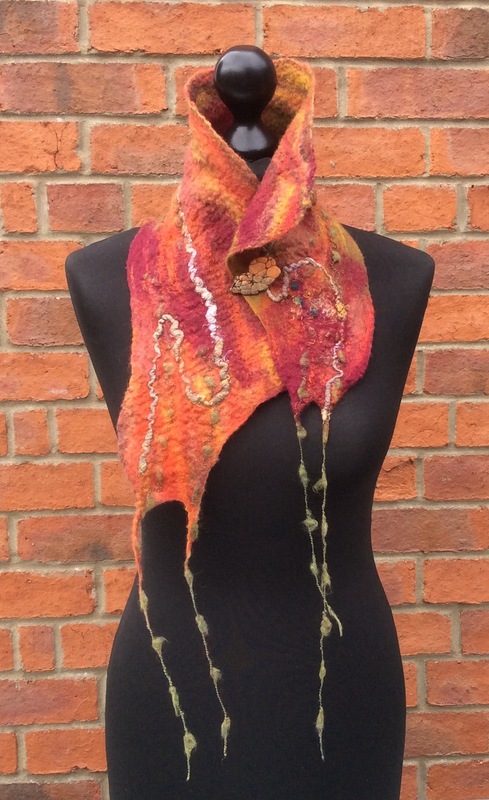 The colours were incredibly vibrant and brighter than intended but the “Dune” Superfine Merino from World of Wool has knocked it right back and it looks very subtle in the finished scarf. 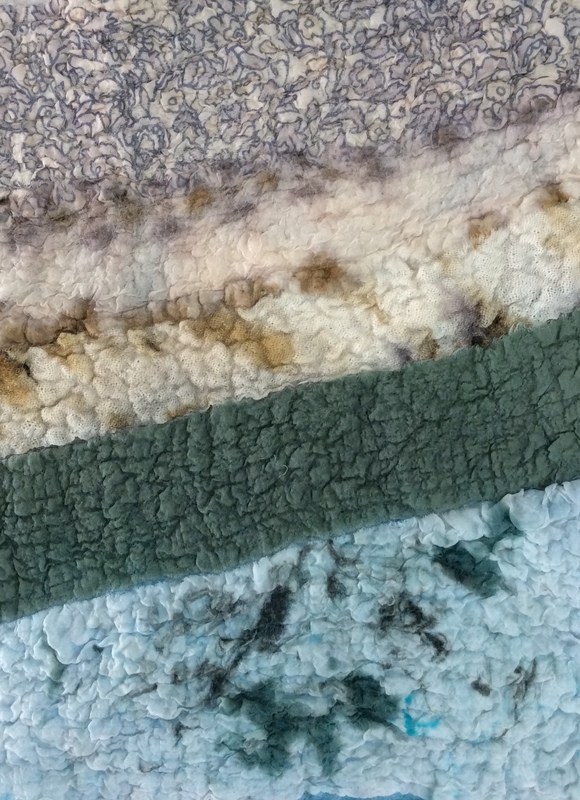 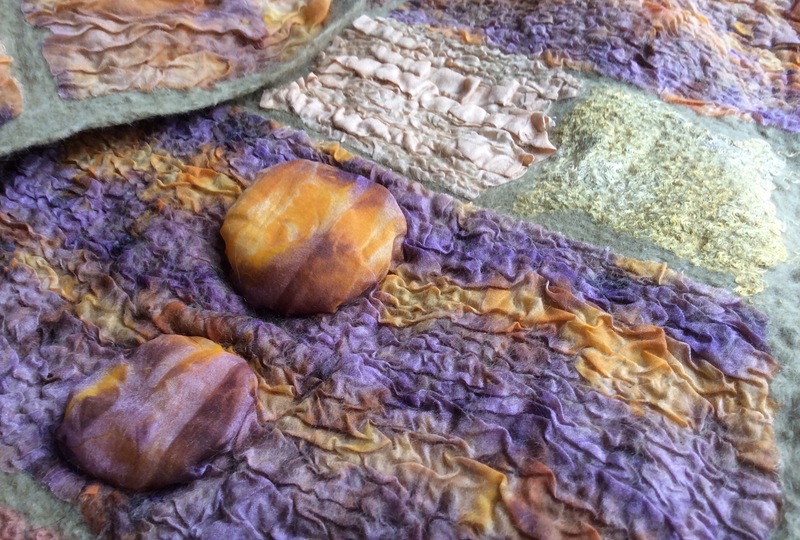 All together there were tiles from four different silk fabrics, this close up shows some of the wonderful textures that have resulted from them. 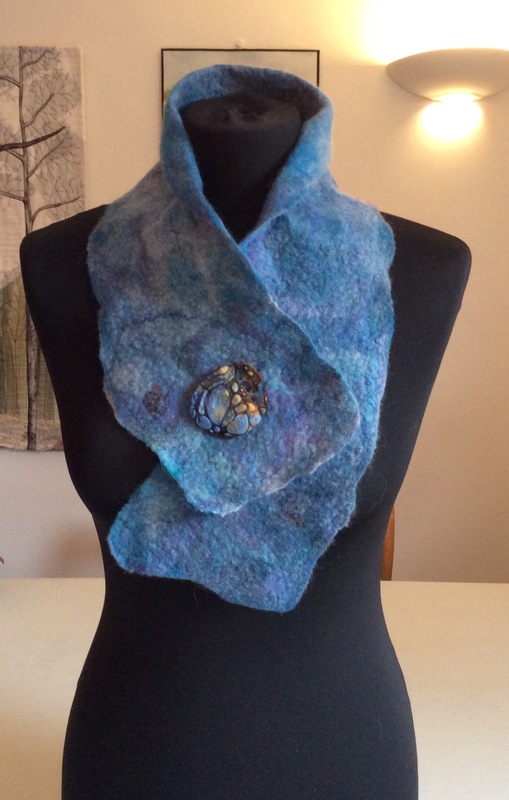 Nuno felted collar, still wet but looking lovely! 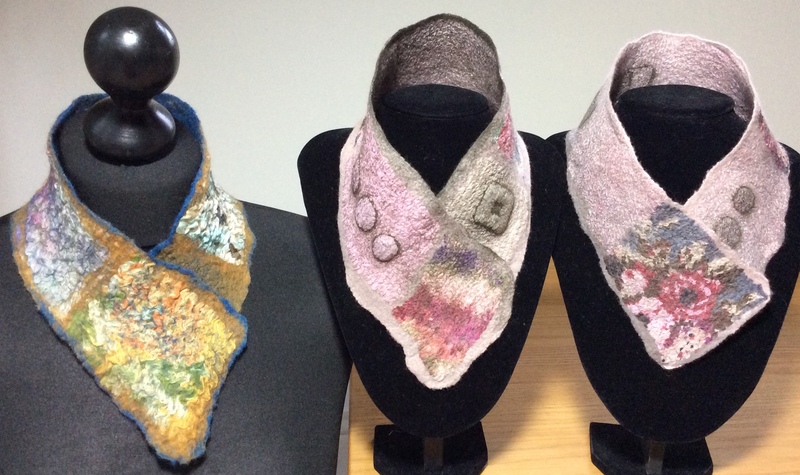 Tomorrow I will post a photo of the finished collar……once it’s had time to dry out and show its true colours.